The Association For Creative Industries releases an update to its benchmark research study on the size and state of the U.S. creative products industry. “These new findings support the need for retailers and suppliers to engage with their customers through an omni-channel strategy that integrates satisfactory in-store, online and print shopping experiences,” said Mark Hill, President & Chief Executive Officer, AFCI. 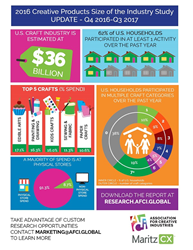 According to new research commissioned by the Association For Creative Industries (AFCI), crafters are increasingly moving to multi-channel shopping. An ongoing study by MaritzCX reveals more than half of U.S. crafters purchase creative products in physical stores only; however, this number has declined across 11 product categories, ranging from 1% to 16% since the study began in January 2016. The research, which is an update to the 2016 Creative Products Size of the Industry Study, also discloses a recalibrated market size of $36.2 billion, yet stable consumer spending and growth in participation with 62% of U.S. households partaking in at least one creative activity in the past year. 91.3% of consumer spending occurs at physical stores, accounting for 91.3% of the market, while 8.7% occurs at non-physical stores. Physical stores are defined as craft chains, discount chains, dollar stores, local craft stores, art supply stores, supermarkets, hardware stores, office supply stores, home goods stores, club stores, craft shows, department stores, drug stores, in-home parties or other. Non-physical stores are defined as internet or online stores, such as Amazon, Ebay and Etsy, websites of physical stores, catalogs, TV shopping or other. MaritzCX started collecting data on purchasing channels in July 2016, a survey change that shed light on the tendency of people interviewed to overstate online spend. Based on the new data available and comparisons made with e-commerce figures from the U.S. Census Bureau’s Monthly Retail Trend Survey, the recalibrated market size is roughly 13% lower than previously reported levels. Comparing recalibrated numbers, recent market spend is approximately 4.5% lower than levels reported in January 2017. This decline is outside of the +/- margin of error of 3.5%, meaning it is a true decline. However, looking at rolling yearly figures, the market has been rebounding slowly from a decline seen between the second quarter of 2016 and the first quarter of 2017. The benchmark update also identifies craft trends in the U.S. based on year over year data, including demographics, spend, total household participation, participation by product category, and cross-participation. These statistics and trends will be showcased at Creativation, the largest creative industries event in the U.S., taking place January 18-22, 2018 at the Phoenix Convention Center in Phoenix, Arizona. The new findings comprise voluntary responses of 6,194 U.S. adults ages 18 and older collected between October 2016 and September 2017. The study is free of charge to AFCI member companies on the Association’s website at http://research.afci.global. Non-member companies interested in purchasing the report should contact Keri Cunningham, Senior Director of Marketing and Research, at kcunningham(at)afci(dot)global. The Association For Creative Industries (AFCI) is the premier trade association for the global creative arts products industries. AFCI strives to deliver innovative high value services as we support our Members who provide products and services to educate, entertain, and inspire creative consumers. Our Members include the manufacturers, retailers, distributors, designers, educators, digital content providers, professional makers and DIYers, and other creative professionals that comprise the $36 billion+ creative arts industries around the globe. For more information about AFCI, membership, or its annual Creativation trade event, visit http://afci.global.